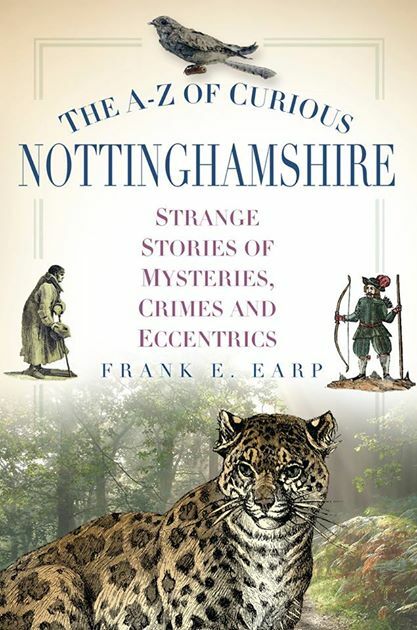 GUEST BLOG: Frank Earp’s The Legend of St. Catherine’s Well Or The Fair Maid of Newark. I’ve mentioned Frank’s work in last month’s 101st post. Frank is very well known in what is or was called Earth Mysteries, circles. A true pioneer and very knowledgeable, he has just had the book A-Z of Nottinghamshire curiosities published (see link below) More can be read of his credentials on the link below too. He recently wrote and published this article in a local Nottingham newspaper and I am more than happy to re-publish an abridged and slightly edited version below. I hope next year to bring more guest writers in…so if you fancy writing about holy and healing wells let me know. Fair Maids seem to populate the folklore of Nottinghamshire, one such beautiful women, Lady Isabel de Cauldwell, – who we might well call the Fair Maid of Newark, – is a central character in the legend of St. Catherine’s Well. Unfortunately, this one too has a tragic ending. Lady Isabel de Cauldwell was said to be the beautiful daughter of Alan de Cauldwell, who in the 14th century lived in Newark Castle. Her great beauty, intelligence and ready wit, attracted many suitors but Isabel had eyes for only two, Sir Guy Saucimer and Sir Everard Bevercotes, Lord of Balderton. Some say that all three were childhood friends. Both men were handsome, rich and full of knightly virtue. Each in turn had asked Isabel for her hand in marriage but she loved both equally and refused to give an answer. With each new rejection the bitterness in the two Knights grew. Finally the two rivals told Isabel that she must choose one of them as her husband and if she did, the rejected suitor would be content. Although she searched to the depth of her heart, Isabel could not choose between them. The Knights decided that the only honourable alternative was to fight for her hand, God would decide the victor. On St. Catharine’s eve (23rd/24th Nov.) the combatants met in a field on the bank of the river Devon, just outside the town gates. First both men broke their lance on the others shield and then, on foot the sound of sword against sword rang-out in the night air. Both were equal to the other and for hours the fight continued. Finally, Sir Guy began to get the upper-hand and landed a mighty blow on Sir Everard’s helm. For a brief moment Everard stood motionless and then fell mortally wounded to the ground. A great gout of blood gushed from his gaping wound propelled by his still beating heart. As if to receive the blood the earth opened, but instead a clear spring of water erupted from ground. Blood and water mixed and flowed in a stream down to the river. Sir Guy gazed down at the lifeless corpse with horror and then ridden with guilt fled the scene. When news of events on the banks of the Devon reached the Castle, Lady Isabel, – the Fair Maid of Newark, – fell into a swoon. Grief stricken she was taken to her sick-bed and within hours died of a ‘broken heart’. Meanwhile, Sir Guy had reached London where he joined a band of pilgrims bound for Roman. Throughout the vogue from Dover to Calais, Sir Guy became increasingly weak in body and soul and his fellow pilgrims were forced to abandon him in France. As if to add to his troubles Guy’s body became wracked with leprous sores, which he saw as God’s punishment. For a long time Guy wondered the French countryside as a leper and beggar. Finally he hide himself away in the Forest of St. Avold where he lived a poor and wretched life. The days and nights past slowly for Sir Guy until the night when St Catherine appeared to him in a dream. The shinning vision told him that the only relief for his torment was to be found in the water of the spring that issued from the spot where he had slain Sir Everard. Sir Guy made a long and painful journey back to England where seeking full absolution for his sins he was consecrated as a hermit. On returning to Newark, Guy bathed in the spring and his leprosy was cured. In grateful thanks Guy built a carved stone wall around the spring and close by a small chapel dedicated to St Catherine. For many years, until he died of old age, Guy lived as a holy hermit by the spring, where he administered to the needs of those seeking a cure from its healing waters. Locals called him St Guthred. The waters of St Catherine’s Well, – now in the grounds of a private house, – still flow to this day. The St. Catherine’s Well legend purports to have been first written down in the 15th century, although no document of this date containing the story can be found. 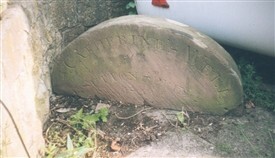 One of the most complete written versions of the story is that of W. Dickinson in his book ‘The History and Antiquities of the Town of Newark’ 1816. Here Dickinson falls into the trap of accepting the tale as a first-hand account of the Well’s 13th or 14th century origin. He goes on to state that proof of this is found in the fact that two of the names mentioned in the story, Caldwell and Saucimer are found in the Chantries founded in St Mary Magdalene’s Church in Newark. However, a number of other later authors suggest that Dickinson was in fact given an ‘invented’ story as a joke. If I believed this to be the case then our investigation would end here! If indeed the St Catherine’s Well legend is what we might term a fake, then it is a ‘good one,’ created by someone with knowledge of tradition and folklore. At first glance the story does appear to be a medieval tale, whether a 19th century invention or not. However, a more detailed examination shows that it very carefully combines elements of two or more classic folktales. Just because the story has a medieval setting does not mean it has a medieval origin. True folkstories of this kind are often subtly changed to incorporate elements from the age in which they are told. Springs, wells and other valuable water sources, – especially those believed to have healing properties, – have been venerated since the remote past. With the later Christian acquisition of ‘pagan holy wells’ and healing springs, the sites were rededicated to an appropriate Christian Saint. Likewise, any existing oral tradition relating to the sites former use or origin was likewise changed. As the St Catherine’s Well legend can be directly compared with very similar stories of other holy wells, it appears to have been given a medieval Christian ‘gloss’. Can we see any distinctly ancient or pagan roots in the St Catherine’s Well Legend? In telling the story of the Well, the legend appears to combine two classic themes. The first of these is that of the Fair Maid. The idea of the beautiful women, – the fair maid, – and her two rival lovers is a very ancient one. It is believed to depict the annual cycle of the solar year with two distinct seasons of light and dark, – summer and winter, – conflicting for possession of the Earth goddess. The primary story is to be found in the Celtic myth of Creiddylad. Here the two halves of the solar year, represented by the gods Gwyn ap Nudd, – winter, – and Guthyr, – summer, – must fight every May Day for the possession the goddess Creiddylad, – spring. As at this point in the year, their powers are equal; their battle is destined to be eternal. However, at other significant times of the year, one season, – god, – or other is dominant and has temporary control of the goddess. The Creiddylad myth begins with Gwyn, – winter, – kidnaping Creiddylad, – spring. This sets in motion a bloody war between the factions of Gwyn and Guthyr. Such is the slaughter on both sides, (a cosmic imbalance), the high king Arthur intervenes and declares that the two adversaries must fight annually at the midpoint of the year until the end of time. If we now compare the St Catherine’s Well legend with the primary Celtic myth, we can see there are many similarities. Does this point to an ancient Celtic origin and veneration of the Well? Given the time of year at which the fight is said to have taken place, St Catherine’s Eve, – which approximates the winter solstice, – and Sir Guy’s apparent victory, it may be speculated that Guy is Gwyn the winter king. If we take the story further we can see that Guy’s victory results in his self-imposed exile and the death of Isobel, his ultimate prize. His victory is therefore incomplete. I believe that at this point the original ending to a Celtic story has been lost or deliberately changed when the Well received its Christian dedication to Saint Catherine. We have already seen that the first part of St. Catherine’s Well legend bares strong similarities to stories told about pre-Christian sacred sites. There is evidence too that the remainder of the story suggests a pagan context.In the 13th and 14th centuries, – the time of the supposed origin of St. Catherine’s Well in Newark, – many pagan and early Christian ‘holy wells’ and ‘healing springs’ received what today we would call a ‘make over’. The established Church through the many Monastic Houses saw the perceived increase in the popularity of such sites as a valuable way of making money from those seeking cures for their ills In a strong marketing ploy pre-Christian sites were re-branded with a name change and dedication to an appropriate Christian Saint relevant to earlier associated traditions of the site. In some case, originally open springs were enclosed and new attendant chapels were built. To control access to the sites monks or hermits were installed to collect a revenue from those seeking a cure. Remember that the second part of the St. Catherine legend tells how Sir Guy returns to Newark seeking a cure for his leprosy in an existing healing spring, – all be it one of his own accidental creation. The legend goes on to say Guy encloses the original source of the healing waters and builds a chapel. He dedicates the Well and chapel to St. Catherine and becomes its first Christian guardian, – a holy hermit attending the needs of others seeking a cure from the spring. This medieval Christian adoption of healing springs and holy wells is clearly demonstrated in the history of Nottingham’s ‘premier spring’, St. Ann’s Well. The well had been known as a place of healing long before the monks of Lenton Priory ‘seized the great spring of the town’. The earliest references to this site include the names Brodwell, and Owswell, – the later associating it with the pagan Saxon goddess Eostre.Much to the annoyance of the local population, the Priory dedicated the Well to St. Ann. In 1409 a chapel of the same dedication was built next to the Well, thus sealing the Priory’s authority over the site. There are many familiar themes in St. Catherine’s story. We have already seen that her ‘feast day’ approximates the time of the mid-winter solstice. In St. Catherine’s story we once again find a ‘Fair Maid’ wooed by a ‘dark lord’ at the time of mid-winter. Part of the celebration of her feast day was the lighting of a wooden wheel, – .the origin of our modern Catherine wheel firework. The origin of this practice is unknown, but it is interesting to note that in many parts of pagan Britain it was customary to mark the winter solstice by rolling a burning cart-wheel down a hill. Given the evidence so-far, the St. Catherine’s Well legend seems to suggest that the healing spring was once a pagan sacred site dedicated to a spring goddess, – the Fair Maid, – and her progress through the winter months of the cycle of the year. When Sir Guy returned to Newark seeking the healing waters of the spring where he had slain Sir Everard, he was suffering from leprosy. This dreadful disease would have been familiar to the medieval audience of the legend, as would its association with healing spring and wells. Leprosy, self-imposed exile and a healing spring are the themes behind the founding of the City of Bath. Around AD 43, Roman engineers began to develop a and was i local deity, the goddess Sulis whom the Romans associated with their own Minerva. A town which the Romans called ‘Aqua Sulis’, – the Waters of Sulis’, – grew up around the spring. Writing in the 12th century, the Welsh monk Geoffrey of Monmouth, give his own account of the founding of Bath in his book ‘Historia Regum Britanniae’, (History of the Kings of Britain). He tells how a young prince, Bladud caught leprosy and was imprisoned by the Royal Court to prevent an imperfect King ascending to the throne. Bladud escapes prison and goes into exile far from the Court. He becomes a swineherd tending is pigs in a remote forest. As time passes he notices that his pigs have also contracted leprosy. However, observing the pig closely he finds that each morning when he ‘turn‘s out’ his animals some of them wonder off out of the woods. When they return, they are covered in a black mud and free from disease. The next morning Bladud follows the pigs and finds that the animals roll in the mud of a hot spring some two miles distant from his dwelling. Bladud decides to bathe in the spring and finds that when he emerges he is free from his leprosy. Cured, he returns to his father’s Court and later succeeds him to the throne. Bladud himself is later succeeded by his son Lear, made famous by Shakespear. Bladud does not forget the place of his miraculous cure. 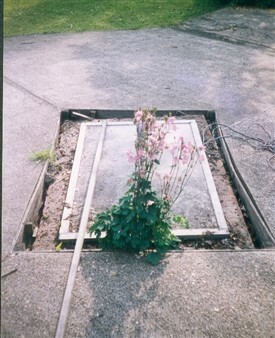 He builds a ‘bath’ around the spring so that others might take the cure. Geoffrey’s book is not a true history of actual Kings. He sets Bladud’s story over 800 year after the Romans had founded the city of Bath. Bladud’s tale is taken from pre-Roman Celtic mythology. Here we find him as the father of the sea god Lier and not a king. We can now see how the St. Catherine’s legend compares with those of other holy wells and healing springs and has all of the elements of these ancient tales. However, there is one final twist to the story which other writers on the subject have missed. The story contains the name of another Christian Saint. The story tells how as the hermit guardian of the well Sir Guy is known locally as St Guthred. St. Guthfrith or Guthred is a saint associated with the 9th century king of Northumbria and Viking York. Could it be that the Newark well was original dedicated to Guthred, a name which remained in the popular imagination long after it was dedicated to St. Catherine in the 13th/14th century. No archaeological evidence for a chapel close to St. Catherine’s well has ever been found. Perhaps this is because the search has been in the wrong place. An alternative ending to the St. Catherine’s story states that Sir Guy could not build his chapel next to the well as the site frequently flooded. Instead he chose the site of a second spring in the same aquifer, which was on slightly higher ground. Could it be that St. Catherine’s Well is one of two or more healing spring? Evidence of this is perhaps to be found in the words of an inscription on a stone which is said to have once covered the well; ‘St. Catherine’s Well Sutton springs 1882’. You may be interested in my article on this website. Thanks go again to Frank and I direct you to purchasing the excellent book A-Z of Nottinghamshire curiosities from http://nottinghamhiddenhistoryteam.wordpress.com website. “Weird, spooky, gruesome, humorous, and strange but true stories come alive in The A-Z of Curious Nottinghamshire. ‘Curious’ is perhaps not the first word you would use to label Nottinghamshire. But ‘curiouser and curiouser’ it becomes when you dig below the surface. Here the reader will meet highwaymen and hangmen, saints and martyrs, flying cars and bedsteads. To sum up, eccentrics, legends, folklore, murders, scandals, ghosts, incredible characters and oodles of wow factor, all may be found within the pages of this book”. Posted on May 19, 2014, in Nottinghamshire, Pagan gods, Saints and tagged antiquarian, archeology, Cuckoo Press, earth mysteries, folklore, Frank Earp, Holy Well, Holy well blog, Holy wells blog, Holy wells healing springs Spas folklore local history antiquarian, legends, Nottinghamshire, Saints. Bookmark the permalink. 2 Comments. I appreciate your use of the word “sacred.” Very appropriate!